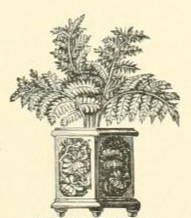 This black and white potted tree drawing reminds me of a Victorian-era drawing room or solarium. The elaborate design on the square pot along with the frond-like leaves also has a tropical feel to it. Could you not just see something like this on the set of Casablanca?